C. Markham’s Pink in full bloom. Here in Seattle (unlike the rest of the cold and snowy US) we had a mild winter and an unseasonably warm early spring. 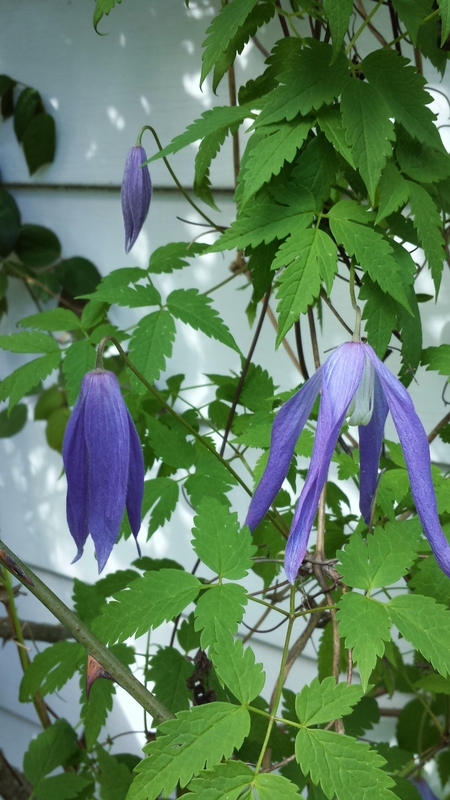 As a result, all my atragene clematis, a group of clematis that includes alpinas, macropetalas, and koreanas, bloomed for me in March this year, more than a month earlier than usual! These tough, cold-hardy harbingers of spring all have delightful bell flowers in many colors and delicate serrated apple-green foliage. 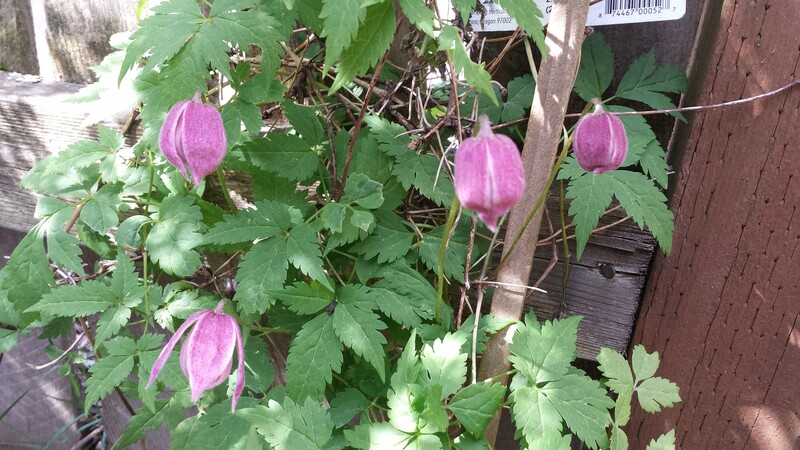 More of this group of clematis will no doubt make their way into my clematis collection. Clematis Markham’s pink was the first to bloom in my garden this year. I love it’s soft pink blossoms and the small round pink balls that are its buds. 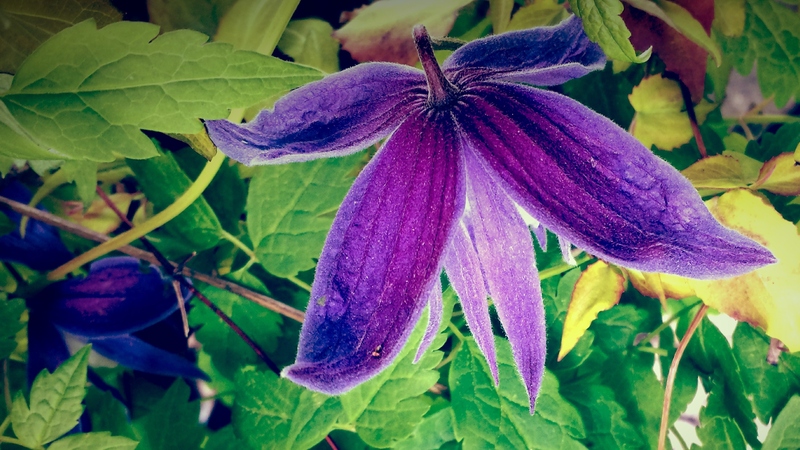 This clematis was named for Ernest Markham, an important early clematarian who, along with William Robinson, is responsible for saving many fabulous clematis hybridized by Francois Morel in the late 1800s and very early 1900s. Among Morel’s hybrids are some of the most popular clematis still today: C. Perle d’Azure, C. Ville de Lyon, and C. Comtesse de Bouchaud, along with many others. 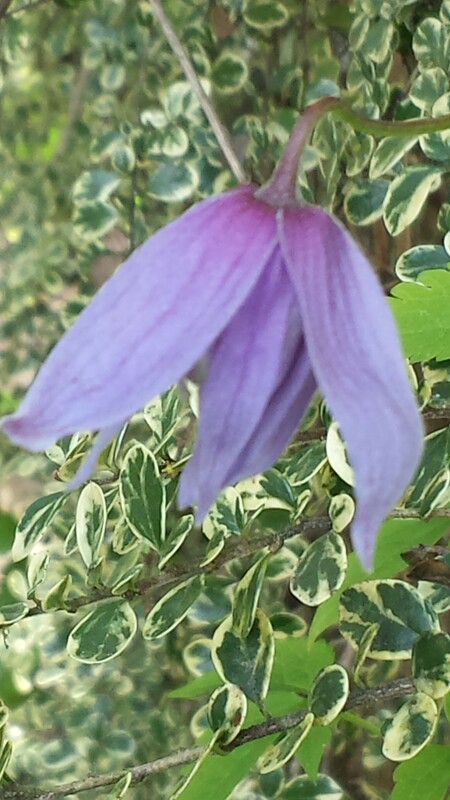 Clematis Joe Zary, with it’s sputnik flower. Also blooming in March is C. Joe Zary (a macropetala). It’s new for me, as of last spring, and came highly recommended from Debbie of Silver Star Vinery. Not only does it have spiky lavender flowers that remind me of sputniks or sea anemone, it is reputed to repeat bloom throughout the summer. 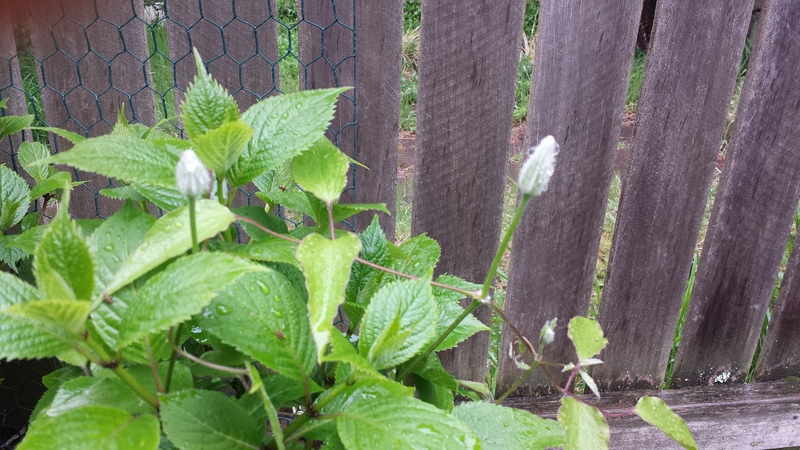 I can’t wait to see it blooming along with its host, a blue lacecap hydrangea. C. alpina Cecile was blooming too high up in a tall variegated Azara for a good photo, but below are some of the other clematis that were showing off in my garden in March. 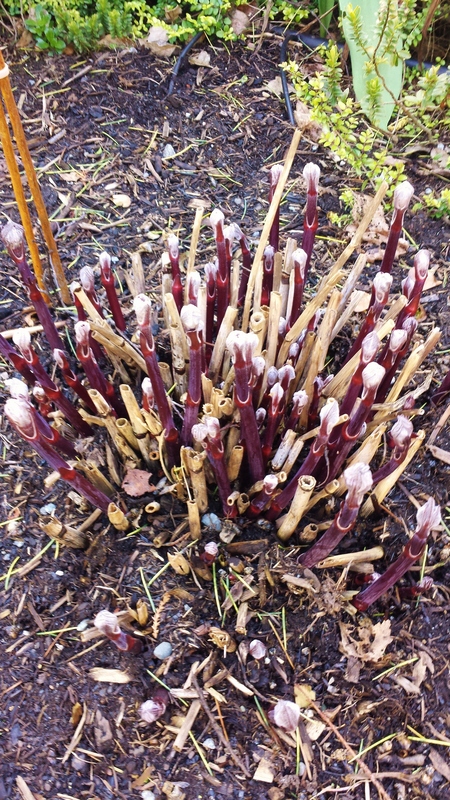 Purple stems of C. recta purpurea already sprouting in March! 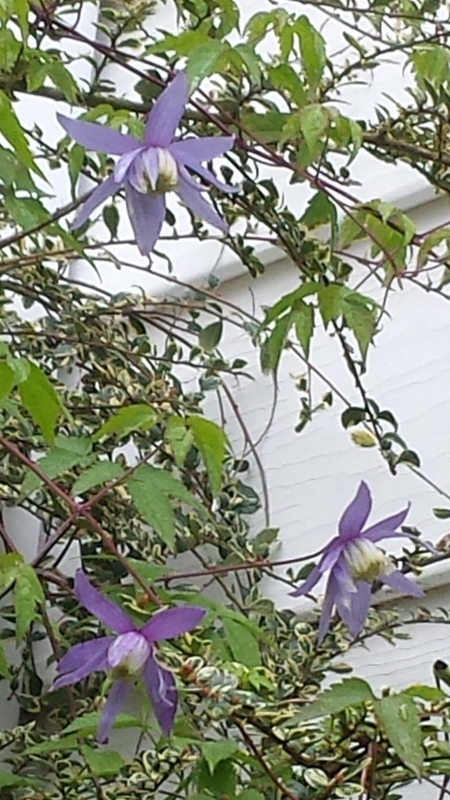 Clematis blooming has begun in earnest at my house. 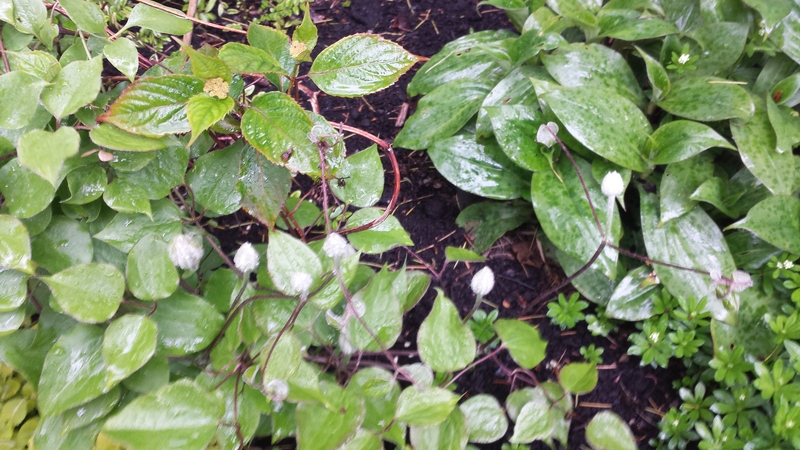 My Clematis alpinas and macropetalas are lighting up the garden with their blooms! I really should plant more of them — what a happy boost they are in the spring. 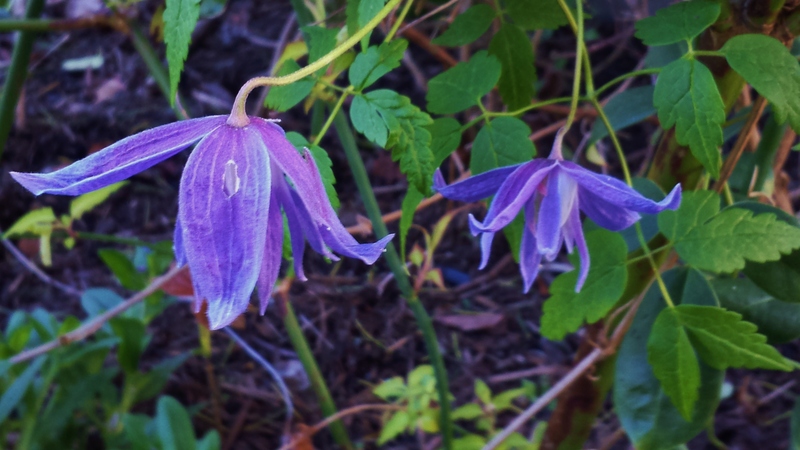 The first to open was Clematis Blue Dancer–again! It was the first to bloom last year, too. 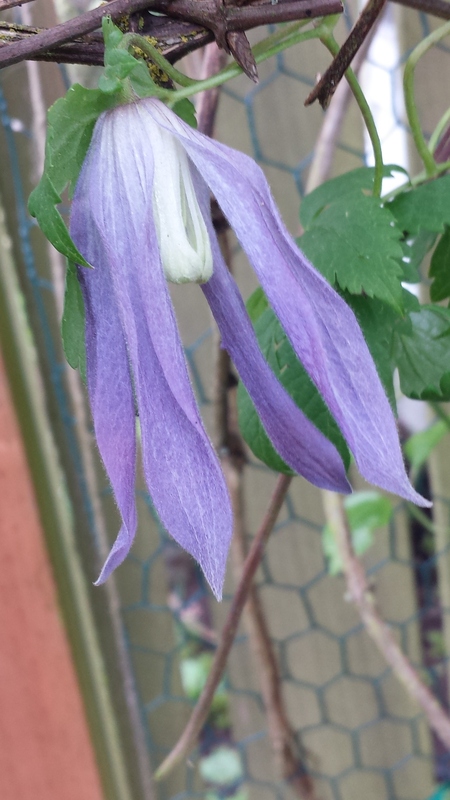 Clematis Blue Dancer, First to Bloom! 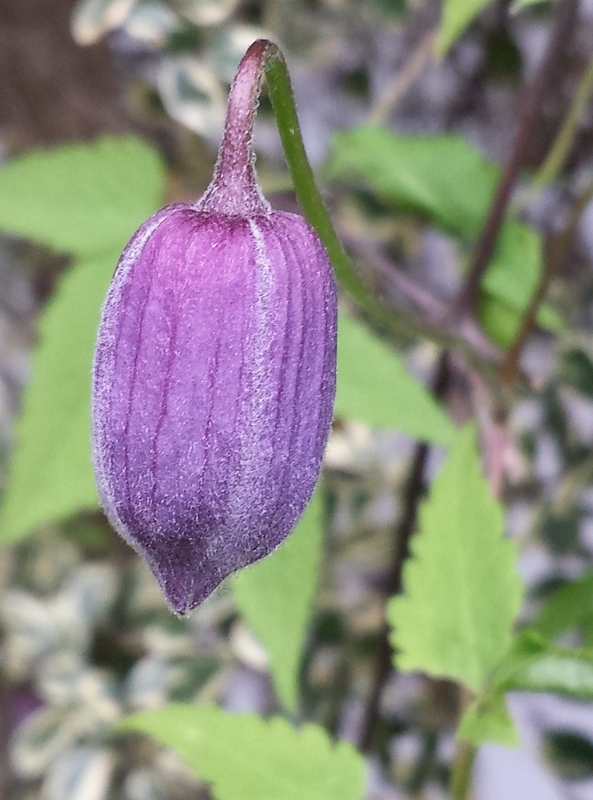 Clematis Markham’s Pink in bud. 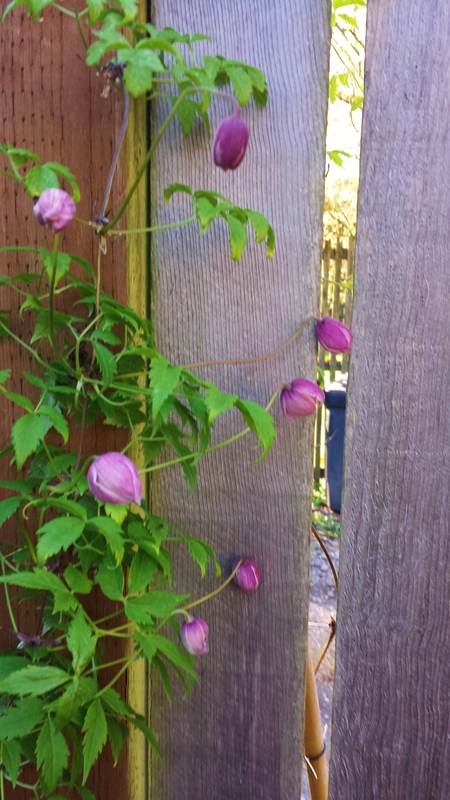 Here’s Clematis Cecile, first in bud, then newly open, and finally fully open. 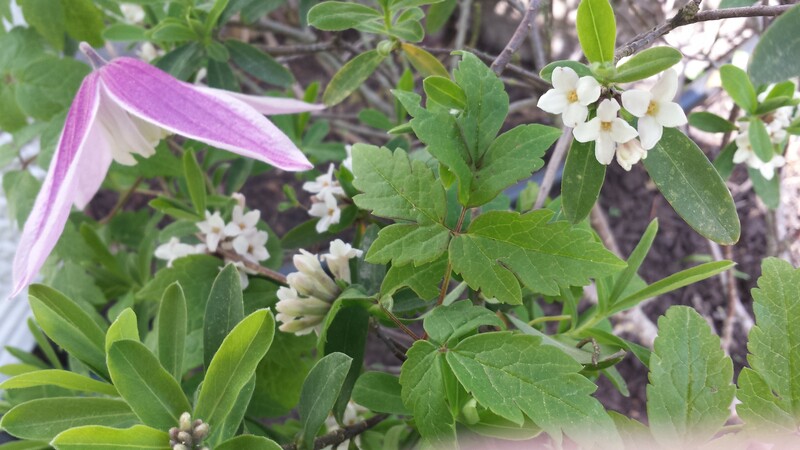 Next up is Clematis Jacqueline du Pre draped over a daphne. 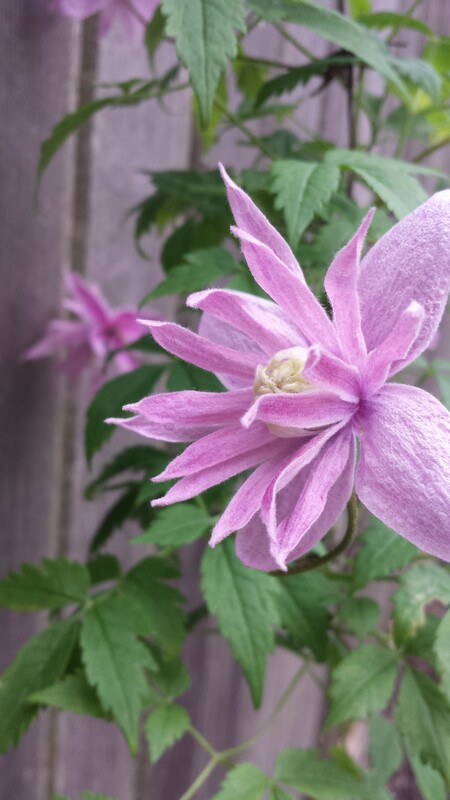 Here are two photos of Clematis Pauline. I’m not sure why the second photo is so oddly intense, but I thought I’d show you anyway. The blooms do present with a luminous color. 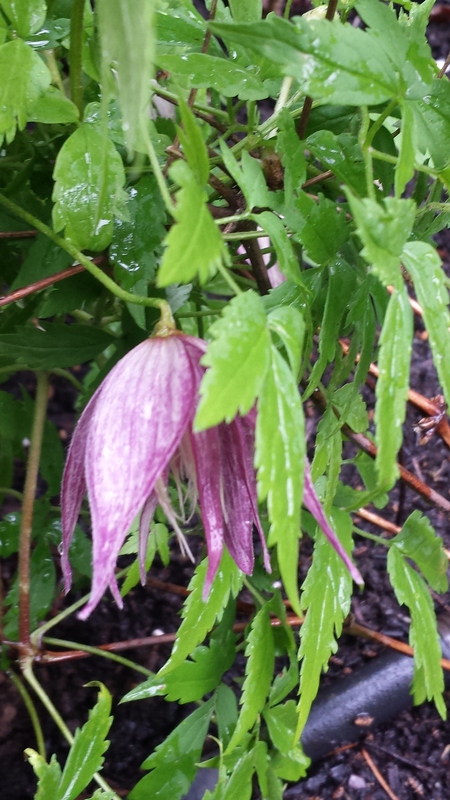 Clematis Joe Zary is a new one for me — I got it last summer from Silver Star Nursery, so it’s quite young still. 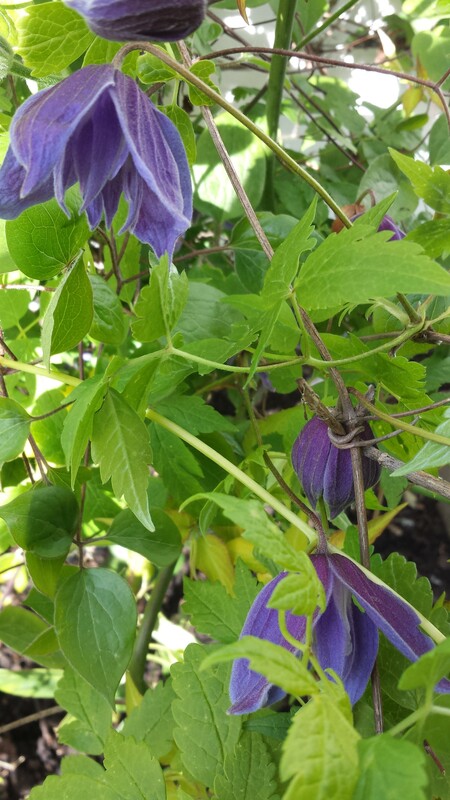 Pruning Group 2 Clematis Already Showing Flower Buds! Below are photos of the buds of several of my May/June Large-Flowered bloomers. Ah, the anticipation! Last year Will Baron and Fair Rosamond were neck-and-neck to be the first in this group to bloom. We’ll see how this year goes. 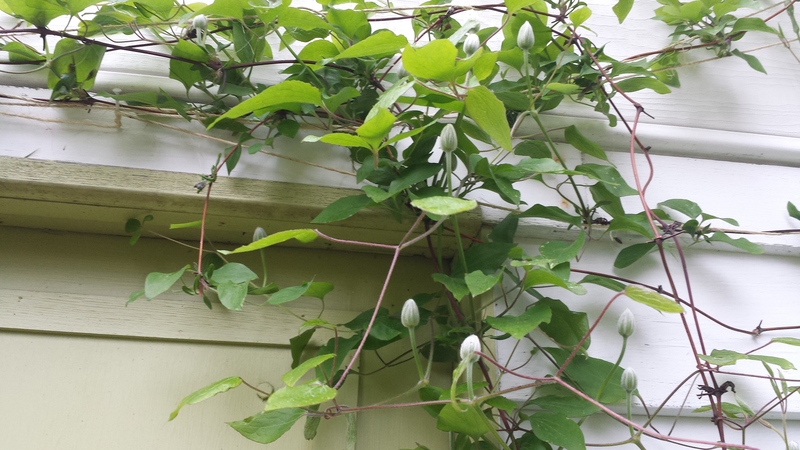 Speaking of Will Baron, you may have read my earlier post about how I was going to be brave and cut back three of the old woody vines on this clematis to renew it. Hrmph–time went by too fast with so many things to do and Will Baron developed lots of buds before I had a chance to prune it. With all those buds, I just couldn’t bring myself to do it. My new plan is to cut out the three old vines AFTER it blooms. We’ll see how I do. 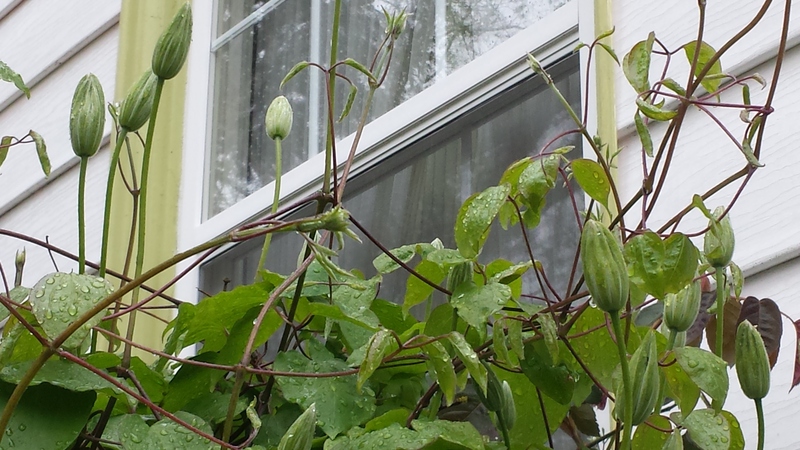 Clematis Will Baron in bud — I chickened out on cutting back the old canes. 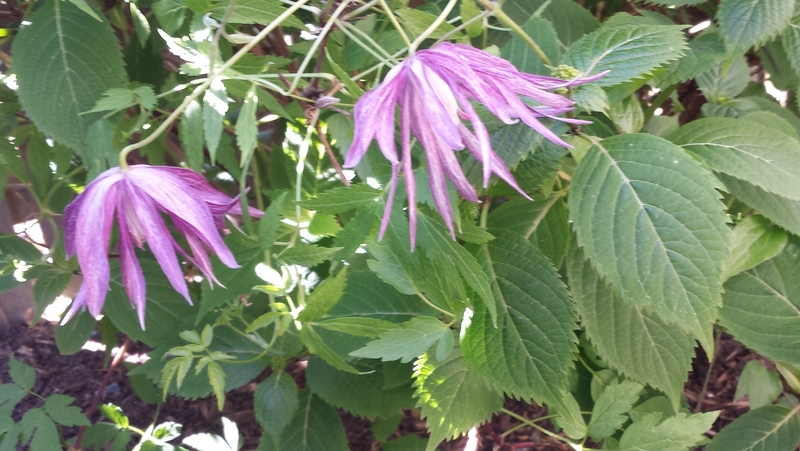 How are the clematis in your garden doing?